Why a maroon EU style passport cover not a deeply satisfying blue – did ships carrying red and blue paint crash leaving the sailors marooned? We can forgive the poncy ‘postrophy but we are the world’s greatest county and do not need to pretend to be a country. What is all that about Republic! We could still be a monarchy with the Duke of York as head of……oh I see what they mean, Geoff Boycott it will have to be. 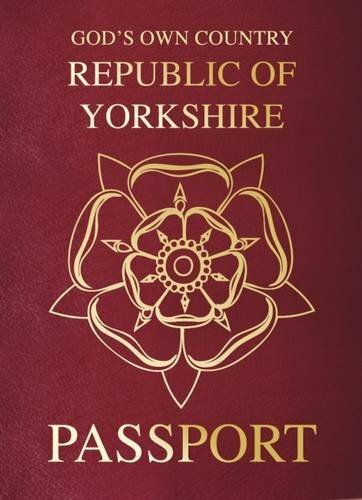 The font for Yorkshire is depicted as being smaller than that used for Passport. A sin worthy of being forced to drink larger or flat, warm, southern beer. Dividing the county by these antics could split Yorkshire in to parts – we have seen two approaches so far and a third would create a riding! The Sophie Walker and the Women’s Equality Party were vanquished in Shipley during the last general election by (General) Philip Davies. We might need to make him Field Marshall if we need to fight again. The joke content of the passport could be taken seriously by any aspirational outsiders ‘Whether born and bred in the Broad Acres, an offcumden, a tourist or even a Lancastrian, the holder of this passport is bestowed official Tyke status’. Bestowed in whose name one might ask. Other Republic pubs like The People’s Republich on Newland Ave in Hull which recently opened so you can play board games and treat them as a cafe. These are frightening uses for a pub. One may be able to forgive all but the Lancastrian comment which takes the Yorkie.